The rational behind using a chart is to see the relationship between price movements in the past and those that will occur in the future. The logic is that the chart patterns represent human behaviour and that that is predictable. The patterns repeat themselves and therefore you should be able to predict future movements in the price. Charts used to be drawn on paper when computers weren’t around but now with advanced technology we can see charts on the computer screen along with a wide range of technical indicators. The very basic construction of a chart has time X axis and price along the Y axis, as shown below. Technicians tend to use three types of charts. 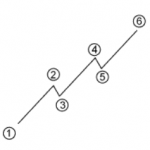 There are other types of chart such as Point-&-Figure and Market Profile but they will not be covered here. A line chart is the most simple method of displaying price action, commonly used in financial newspapers to illustrate market moves. In a line chart, a single price per event (e.g. the closing price of each day) is connected by a simple line. Disadvantage – The disadvantage of using this simple format is that a significant amount of useful data is not displayed. For example, if you use the closing price of each event to draw a line chart, then it is not possible to determine the range or the opening price of each event. For this reason, line charts are rarely used by technical analysts. In a bar chart, a vertical line displays the range of each event, from it’s lowest price to its highest price. A horizontal protrusion to the left represents the opening price and the protrusion to the right marks the events closing price. Long bars, where the difference between the high and the low are larger than normal, are indications of market excitement. This increased volatility has significance to technicians. Where the close is within the bar it can indicate the immediate future direction of the asset. For example, a close at the high of a bar indicates unfulfilled demand and probably means the next bar will open higher and initially steady. The effect is emphasised if there are other signs of market excitement such as a long bar, high volume or a gap. In the 1600s, the Japanese developed a method of technical analysis to analyse the price of rice contracts. The technique is called candlestick charting. Steven Nison is credited with popularising candlestick charting and has become recognised as the leading expert in their interpretation. Candlestick charts display the open, high, low and closing prices of each event – exactly the same as a modern day bar chart, but in a manner that extenuates the relationship between the opening and closing prices. Candlestick charts are simply a different way of looking at prices; they don’t involve any calculations. There are mixed feelings towards candlesticks however they appear to be getting more and more popular with investors, perhaps it is the the ‘long lost Asian secret’ of investment analysis. Regardless, we would recommend you to explore their use. Candlestick charts dramatically illustrate changes in the underlying supply/demand lines. Since candlesticks display the relationship between the open, high, low and closing prices, they cannot be displayed on securities that only have closing prices, nor are they intended to be displayed on assets that lack opening prices. If you want to display a candlestick chart on a security that does not have opening prices, I suggest that you use the previous days closing price in place of the opening price. This technique can create candlestick lines and patterns that are unusual, but valid. Which Chart Type to Use? It is up to you which you would prefer to use. If you intend on doing thorough technical analysis, then the choice should be between the bar charts and the candlestick chart. Here at Assettrading, you will see a lot of candlestick charts because it is our preferred option. As you will see here, there are candlestick patterns that help you predict the direction of the market and so can offer you that edge against other investors.